Part of our "Women into Golf" initiative, "Bubbles and Balls" is a unique opportunity for you to try golf at Enmore Park. No equipment is required, just wear comfortable shoes and clothing and we'll take care of everything else. The sessions last for two hours followed by a social glass of bubbly in our clubhouse, which will give you a chance to meet fellow beginners and to ask your questions. "Bubbles and Balls" is the first phase of our "Women into Golf" programme and whilst there's absolutely no obligation to sign up for the programme, you'll have the opportunity to do so on the day of your visit. Our "Women into Golf" initiative is designed is based on one simple idea: "Have fun and stay healthy". 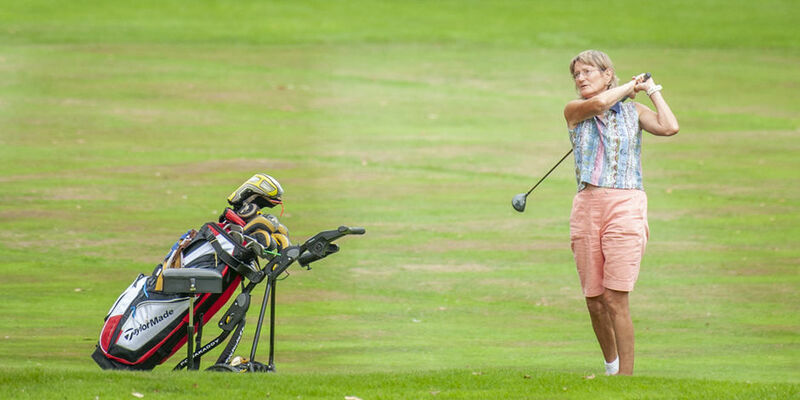 Taking place for a total of eight weeks during May and June 2019, and costing just £80.00pp, it represents a great opportunity for complete beginners to try the game we love. Learning golf isn't just for the ladies of course, and we have a matching programme for gents who'd like to take up the game (or perhaps pick it up again after a number of years). Also taking place over eight weeks you'll enjoy a series of group lessons, a pair of discounted vouchers to play nine holes on the main course, and a free 7 iron to keep. Find out more by calling the club on 01278 672100 (option 4 for the office or option 1 for the Pro-shop). You can also download a leaflet by following this link.